This building that became 25 High Street in Thornbury was one of several properties in Thornbury owned by John Hylpe (or Hilpe). John became a major benefactor in 1605 when he arranged for subsequent owners of these properties to pay a sum of money each year to the Mayor for the benefit of the poor. In the case of this property it was described as being ‘out of a house in the High Street occupied by James Eddys 4/4’. We have been fortunate to find the Mayors Accounts which have given us details of the various occupants of the property since that time. The Eddys – the Mayors Accounts show that James Eddys senior was paying the rent charge on the property from 1619 to 1628. James was a tanner who was also Mayor of Thornbury in 1611/12 and 1618/19. We know that he didn’t always live in the property. In 1625 and 1628 John Bird is listed as being the tenant of James Eddys. James the elder probably died around 1628 as James Eddys the younger was paying the rent charge in 1629 and 1630. The Birds – the Mayors Accounts show that John Bird had a long involvement with the property. We can’t be sure but it is possible that there were two generations of John Bird living there. One John is listed as a tenant of James Eddys in 1625, 1628 and 1630 and one is listed as contributing to purchase of the new town clock in 1634. John was paying the rent charge on the property from 1631 to 1678. The year of John’s last payment (1678) coincides with the death of John Bird the younger, the son of another John Bird who died in 1660. The older John was Mayor of Thornbury on more than one occasion and it is possible that the younger man could also have been Mayor. In 1672 the younger John Bird, bought an orchard on land between St Mary Street and Rock Street (at the rear of 47 to 51 St Mary Street). It is interesting to note that at the time he was described as John Bird the elder which (bearing in mind that his father had died in 1660) denotes that he had a son called John Bird. This property eventually passed to John’s son, William and then to John’s nephew, John Thurston, the youngest son of Robert and Sarah Thurston. John’s will was dated 1st March 1678. John was a mercer of Thornbury. He left a lot of property including a property he had purchased from Walter Boulton in Alveston, a close of land called Cornercroft in Tything of Kington which he had purchased of Ann Jones. He left these to his wife, Edith, during her lifetime and then the first was left to his grand-daughter, Edith Smith (the daughter of John Smith of Berkeley) and the second was left to his daughter, Margaret Bird and then his son, William Bird. He also left his son William the outstanding lease on a property in the Burrough occupied by Thomas Fowler, glover. It is possible that this property was 25 High Street. He also made bequests to his daughter, Sarah Thurston and his sister, Joan Marsh. John made his wife, Edith, his sole executrix. The will was proved in 1679. From 1679 to 1695 Edith Bird was listed as paying the rent charge. Edith must have died around 1695 and the property passed to her son-in-law, Robert Thurston or his father. John Thurston – the Mayors Accounts show that John Thurston was the owner of the property and paying the rent charge from 1703 to 1739. John was the son of Robert Thurston junior and grandson of Robert Thurston the elder. He had inherited the property as a result of his grandfather’s will when he died in 1704. The Kings – the Mayors Accounts show that John King was paying the rent charge from 1747. John King was a mercer who had married Grace Thurston, the daughter of the previous owner of the property on 10th March 1737. The Mayors Accounts show that John King let the property out to tenants. Peter Park is listed as tenant in 1749 and John Grove from 1750 to 1756. Grace King is listed in the Mayors Accounts as the owner of the property from 1756. She died about 1760. In her last will dated 2nd November 1758 Grace left the property she had been let by her husband to their eldest son, John King. For a period of at least 80 years the property was used as a pub or inn. The name of this establishment varied from time to time between the Rose and Crown and The Crown. An article in the Oxford Journal of March 30th 1765 refers to the pub as ‘The Crown’ and reports that Thomas James stole a mare from the door of the pub. By 1793 the Mayors Accounts refer to it as ‘The Rose and Crown’ when Betty Lippiatt was running it. It was ‘The Crown’ again when John Birt was running the pub between 1802 and 1812. When Charles Gayner referred to the property in his will dated 1832 he called it The Rose and Crown. Following Ann’s death in 1785, we suspect that the property was left to her son, John. We don’t have any record connecting John to the property, but John died on 14th April 1789 after the Mayors Accounts show that John’s widow, Elizabeth was paying the rent charge on the property. The accounts book for 1793 shows that the pub was then called ‘Rose and Crown’. Elizabeth continued there until 1799. She died in 1800. William Parker – the Mayors Accounts show William Parker was paying the rent charge from 1813 to 1818. William Parker was an innkeeper in Thornbury when he and his wife, Frances, baptised their son, William, in Thornbury on 6th December 1818. The land tax records show William was the tenant of 13 St Mary Street in 1821. The 1822 record refers to the tenant of the same property as being ‘late William Parker’ but we don’t know if that meant he had died or just moved away. Frances died aged 48 on 22nd May 1827. 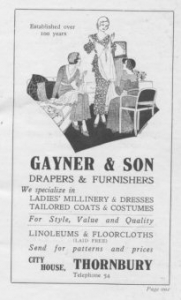 The Gayners – the Mayors Accounts show that Charles Gayner junior was paying the rent charge from 1822 through to 1827. The baptism records confirm that Charles had been a baker when his first child was baptised in 1821 but by the baptism of his second child in 1823 he was now described as an innkeeper. Charles died on 1st September 1828 aged 28 and from 1828 to 1835 his widow, Frances, carried on paying the rent charge . ‘And also all that messuage tenement or Inn situate in the High Street of the Borough of Thornbury aforesaid called the Rose and Crown wherein my late son Charles lately dwelt and his widow doth now dwell with the stables outhouses garden and premises thereto adjoining and belonging and which are now in mortgage to William Stoner and Ambrose Lewis Stoner for securing to them certain principal monies and interests‘. Thomas Lane – a trade directory dated 1839 shows Thomas Lane as licensee of the Crown Commercial Inn in the High Street. It seems possible that Sarah Lane was running a pub as early as 1834 as we have the report of August 21st 1834. John Smith was sentenced to six months for offering base coin to Sarah Lane. He was found to have other forgeries in his possession. The 1840 Tithe Survey shows the property as Plot 184, The Crown Inn, owned by Lewis and William Stone and occupied by Thomas Lane. We suspect that the two ‘Stones’ were the same people called ‘Stoner’ in the will of Charles Gayner referred to above. They appear to have been mortgagees of Charles Gayner and may have assumed ownership of the property at some stage after Charles’s death. Ambrose Lewis Stoner was a brewer and maltster living at Kingswood near Wotton Under Edge in 1841 and 1851 census. He died 6th October 1871. The 1841 census shows Thomas was living there. He was an innkeeper aged 40 living with his wife, Sarah aged 40. Thomas was born outside of Gloucestershire. There were several other people living there, George Gazard a gardener aged 70, James Morton a hostler aged 22, Eliza Baker a female servant aged 20, Susanna Wilson aged 5, and two agricultural labourers, Jude Stinchcombe aged 45, and John Hall aged 25. We believe that George Gazard was Sarah’s father. Sarah Gazard was baptised in Berkeley on 2nd November 1800. Thomas and Sarah married in Berkeley on 11th March 1821. The 1851 census shows Thomas was still the innkeeper at the Crown. He was aged 51 born in Goodrich in Herefordshire. His wife was Sarah aged 50 born in Berkeley. Living with them were Sarah Elizabeth Richards, a niece aged 12 from Berkeley and Robert F Nelmes a nephew aged 5 born in Thornbury and two servants. George Ford, the local pub historian, notes in his book on Thornbury Pubs that the Crown closed in 1858 and that the license was transferred to the Porters Stores. By the 1859 Rate Book, Thomas had moved to the Beaufort at 57 High Street. Thomas died on 29th January 1860 aged 60 and was buried on 4th February 1860. Probate to widow, Sarah. We don’t know what happened to Sarah. The 1861 census shows 14 people living at the property. Edward Gough Councell was a linen draper aged 37. He was employing 6 persons. His wife Mary Louisa was also 37 and born in Devon. They had four children at this time, George aged ten, Mary aged eight, Edward Arthur aged five and Emily two. The household was a very large one; living in the same house was Mary Ann, Edward’s unmarried sister aged 40 and their shop assistants; Eliza Brown aged 18, Eliza Curwood aged 19, Matilda Morse aged 17, Edward Long 20 and Henry Chard 14. They also had two servants Sarah Walker aged 19 and Fanny Brown. In the 1871 census there were only 10 people living there. It says that Edward’s wife, Mary Louisa then aged 47 was born in Somerset. Edward and his wife had Edward Arthur aged 15, Emily aged 12 and a niece Ellen Hannah Brown aged 30 from Devon and three other assistants and two servants. The Rate Book of 1876 shows that Edward Gough Councell owned the premises although it now seems to have been run by William Yates and Herbert Mullings. Presumably Edward and Mary Louisa went to live with their son in Liverpool about this time. Edward Gough Councell died in Grove Park, Liverpool on September 16 1878 aged 55 years. In his will dated dated 9th September 1872 Edward Gough Councell had devised the property to his widow, Mary Louisa Councell during her lifetime. On 22nd June 1898 Mary Louisa Councell of 19 Sydenham Avenue Liverpool widow and her late husband’s trustees, Edward Arthur Councell of 1 Sefton Drive Liverpool surgeon dentist and Emily Culverwell Councell of 19 Sydenham Avenue sold City House to Frances Gayner for £2000. The property was described as ‘all that messuage or tenement then and for many years known as City House with the outhouses stables yard and garden and premises thereto adjoining and belonging formerly in the occupation of E. G. Councell then of H. Mullings and then of F. Gayner‘. Herbert Mullings – the 1876 Rate Book shows that Herbert was occupying the property as tenant of Edward Gough Councell. He appears to be sharing it with William Gates. We don’t know anything about William. Herbert was born in Devizes in 1854. He was the son of Benoni and Elizabeth Eden Mullings. The 1861 census shows Benoni was a master builder employing 16 men, 4 apprentices and 4 labourers. The 1871 census shows Herbert had become an apprentice draper in Newbury. He was aged 17 living in the home of master draper, William Penfold. In 1877 Herbert married one of the daughters of his previous master, William Penfold. Mary Vessey Penfold was aged 15 at the time of the 1871 census. The marriage took place in Newbury but the 1880 Rate Book and 1881 census shows they settled to live in Thornbury. Herbert and Mary had at a daughter, Constance Mary, baptised at the Congregational Chapel on 1st September 1880. The 1881 census shows Herbert was a draper aged 27 living with his wife, Mary V aged 25 born in Newbury and their daughter, Constance Mary who was aged 10 months. They had one assistant living with them and two servants. We know from a newspaper report that Herbert was a supporter of the local rugby team (then using the name of ‘football team’) and he attended a special dinner organised for friends of the club. He was also a Liberal. The family were still living in the High Street property in the 1885 Rate Book. They must have moved shortly after this time. They had another daughter, Ruth Irene born in Ipswich in 1887. Herbert stood for election to the council in in Ipswich in 1898. The 1891 census shows the family living in Lower Brook Street, Ipswich. Herbert was now working as a corset manufacturer. The 1901 census shows them still living there. Herbert had become a commercial traveller. None of his daughters were shown with occupations. They are buried in Felixstowe Cemetery. Constance died in the Gipping area of Suffolk in 1960 aged 83. Francis Gayner – the 1890 Rate Book shows Francis Gayner had moved into the property. The 1891 census shows Frances Gayner occupying the property then called City House. Frances was a draper aged 40. He was living there with Lucy aged 33 and their children: Sidney Harris aged 5, Marjorie A aged 3 and Doris L aged 1 and two assistants and two servants. At first Francis was a tenant of Louisa Councell but on 22nd June 1898 Mary Louisa Councell of 19 Sydenham Avenue Liverpool widow and her late husband’s trustees, Edward Arthur Councell of 1 Sefton Drive Liverpool surgeon dentist and Emily Culverwell Councell of 19 Sydenham Avenue sold City House to Frances Gayner for £2000. The property was described as ‘all that messuage or tenement then and for many years known as City House with the outhouses stables yard and garden and premises thereto adjoining and belonging formerly in the occupation of E. G. Councell then of H. Mullings and then of F. Gayner‘. When the Co-operative Society bought 23 and 25 High Street in 1954 they were added to 27 and 29 High Street which they had acquired from the Councell family in 1946. They continued to let out part of 23 High Street, but the rest of 23 and 25 High Street were used as the drapery department of the Co-op shop until 31st March 1971 when they were all sold to Thornbury Rural District Council for £36,000. The Council demolished the shops to allow them to build the new St Mary Centre Shopping Arcade.